The paintings of Bodil Hedlund give the impression to resurge from a long, inner journey, from distant bits of life, special to the artist herself, but at the same time shared by all of us. Her language seems to have been developed from an existential experience. With paint on canvas, layer upon layer and with several techniques she tells us about human experiences like loneliness, openness, longing and vulnerability. Her palette is subtle, low key and restrained – often in a richly varied grey tone. Or from a review “This is art where “small” is still spelled ”beautiful” and where extreme simplicity could have monumental qualities and offer immense beauty”. 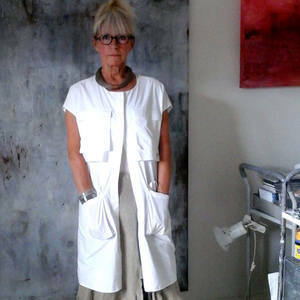 Bodil Hedlund was born 1946 in Östersund, Sweden and now lives and works in Stockholm and Cape Town. She has participated in a large number of exhibitions; not only in Sweden but also abroad (Europe, Chile, South Africa) - among them some 70 solo exhibitions. She is represented in private collections in Europe and South Africa, museums, The Swedish Royal Family collection and The South African Government.